The Harrow Safer Neighbourhood Board has been set up by the Mayor Of London to help make the Police as responsive as possible to local needs and concerns. The Harrow Safer Neighbourhood Board has been established in order to ensure local people are involved in addressing crime. 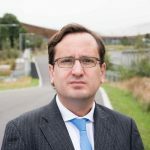 The founding board members were appointed after an interview process conducted by a Harrow Council representative, an ex-Borough Commander and a Local Authority representative – the Harrow Head of Community Safety. The vacancies were advertised by Harrow Council and anyone living or working in Harrow was eligible to apply. We want to ensure that your views and opinions are represented, and that you have a say in helping to set policing and community safety priorities. 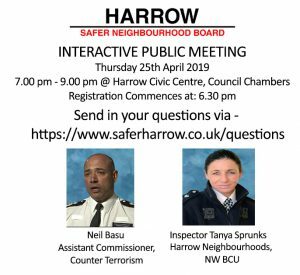 We want to hear about your experiences of crime, and what you think can help make for a safer Harrow. The Board is made up of individuals living and in some instances working in the borough. The board meets formally every quarter. These meetings, although not held in public, have their minutes published via the website once approved at a full board meeting following this. 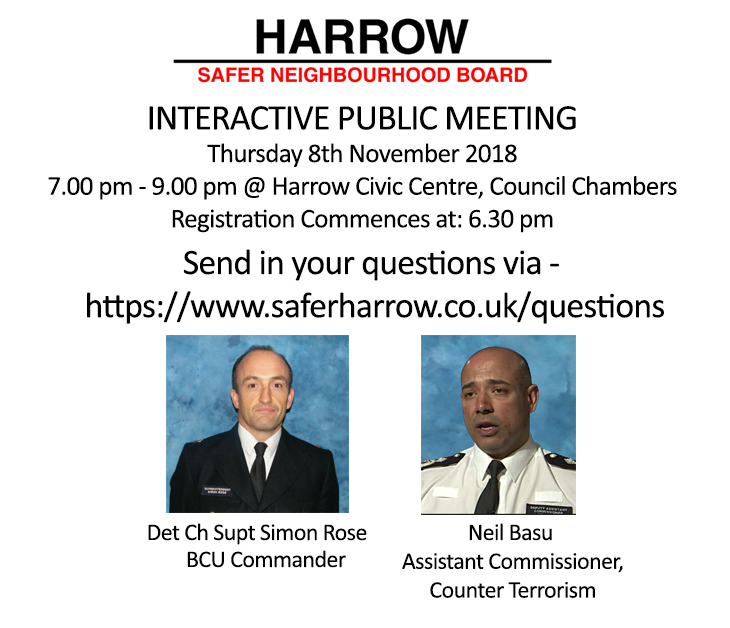 The Harrow Safer Neighbourhood Board holds bi-annual Public Interactive meetings at which members of the public are welcome to attend and can ask their local policing leads questions they may as well as to speak individually to board members, although this is subject to available time at the end of the meetings. The board meetings take place quarterly to ensure appropriate planning and monitoring of community engagement activities. If you wish to submit your questions for the Harrow Police or the Assistant Commissioner for Counter Terrorism, please submit them via the following link in advance of the meeting so that we can try and get them answered during the course of the meeting. This was an introductory meeting for the board to meet each other and to begin discussions relating to how they would move forward to achieve their aims and objectives. The board undertakes a number of activities, including attending meetings with a variety of organisations and individuals in order to ensure we hear the communities concerns and their views on the policing priorities in Harrow. You can visit our news blog to stay up to date with our activity. I have lived in the Harrow Borough for the past 45 Years, 18 of which I have spent in South Harrow and past 27 have lived in Pinner. 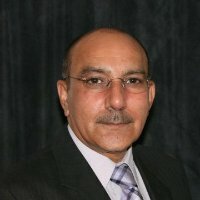 I have worked on various Community Projects including Hindus of Harrow. 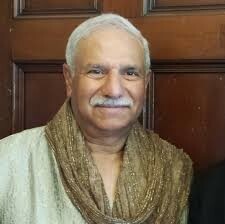 I am also the Chair of Hindu Council (Harrow) and undertake voluntary work for other Charitable organisations. I am very passionate about the well being of Residents of Harrow. 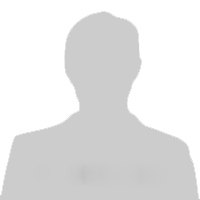 I am Self-Employed Accountant and have been practising for nearly 40 years. 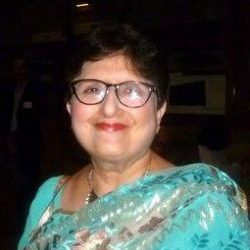 Resident of Harrow since 44 years.Volunteering 40 years in NHS sector for UK Thalassaemia Society. Carer and Vice Chair Carers Harrow. Passionate about local and London POLICING.Served two decades working closely with New Scotland Yard, City Hall and the Home Office. Keen interest in International Politics. My family and I have been living in, Kenton, Harrow for over 30 years, my children went to schools in Harrow and took part in many community activities including Police Cadets. I have been a member of organisations serving the community and assisting in fundraising for worldwide disasters, like the tsunami and earthquakes, etc. I am a serving community champion for my street, working with the council and the police, since my children have grown up I am able to contribute more to other activities in the borough. I have my own business based in Harrow supplying office furniture. I have lived in Harrow for more than 40 years and our three children attended local schools here. I care much about my local environment and the changes occurring. I have been a Broadcast Engineer with the BBC for 30 years and then worked at the BFI National Archive as a Preservation Engineer. Now retired. I am also a Neighbourhood Champion. I grew up in Kingsbury and have lived in Harrow for 27 years with my children having attended schools in Harrow. I am a community champion and active within the Greenhill Residents Association. I am very passionate about safety in our borough and community and am elated Harrow continues to be the safest Borough in London. My background is in banking, and I previously managed our various optical businesses. Having been a resident of the borough for over 15 yrs, my involvement with community initiatives stemmed from being an Independent Custody Visitor in 2006 (up to date), and having witnessed the dynamic society that makes this the great borough that it is. My background is in Aviation, Information Technlogy & IT Security, and I am honoured to be serving the HSNB as a board member and a respresentative on various partnership & pan-London initiatives. Members representing other organisations are nominated by those organisations. The organisations that were asked to nominate members were Harrow Council (2 members), Harrow Independent Custody Visitors (1 Member), Harrow Victim Support (1 Member) and Harrow Youth Parliament (2 Members). These organisations were selected as part of the Mayor of London’s Manifesto commitment. representatives from Harrow Council are Councillor Paul Osborn (Conservative) and Councillor Krishna Suresh (Labour). 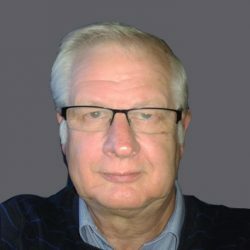 Councillor Paul Osborn is the Leader of the Conservative Group, Strategy, Partnerships & Community Safety Shadow Portfolio Holder. 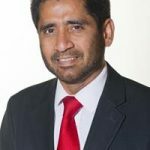 Councillor Krishna Suresh is Community Cohesion & Crime Portfolio Holder for the borough of Harrow, and member of the Labour Party. Victim Support is represented by Kenny Tang who is the service delivery assistant responsible for Harrow. Their recommendations can require the police to make improvements for the welfare of detainees. Working as part of a local panel, they play a valuable role in maintaining public confidence in this important area of policing. London Ambulance Service is represented on the HSNB by an appointed member. The board receive support from MOPAC through Tanya Silverman who is the MOPAC single point of contact for Harrow Borough. The board receives representation from the MPS through the NW Area BCU Commanders office who is the MPS single point of contact for HSNB. The board receives representation from the BTP through the Regional BTP Commanders office. You can contact the Harrow Safer Neighbourhood Board at the email address below, or simply by completing our contact form below. We welcome all comments from the Harrow community. Please note, we are unable to comment on any individual issues. As we work closely with a number of agencies, please note your comments may be used to help inform our activity.